news and more chances for you to win. 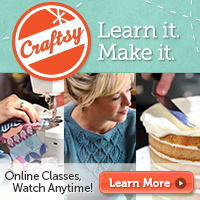 and you’ll be entered for a chance to win a free online Craftsy class! The nominations are being accepted from the 1st October - 14th October. with winners announced on October 29, 2013. Craftsy is selecting three winners in each category. a badge for their site and possibly a promotion on the Craftsy website. scroll to the bottom of the page and click where it says, "click here to get started." What is the URL of the blog you'd like to nominate? What category are you submitting the blog in? What award are you submitting the blog for? Then enter your email details. Press submit and that's it! But not only that they have more amazing news! they have more new fantastic courses! Wow what a fantastic range of courses they have available now! So good luck and I hope you win a course!